Chief guest Sakya Trizin, special guest Speaker of TPiE and Kalon Yuthok Karma Gelek and other dignitaries. Regional Dhomay Association, Dhondupling, Clement Town in Dehradun observed the commemoration of the 30th death anniversary of the 10th Panchen Lama, His Eminence Gedun Choekyi Gyaltsen on 26 January, 2019. 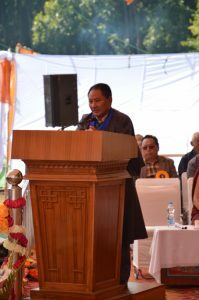 The Chief Guest of the commemoration was the 42nd Sakya Trizin Ratna Vajra Rinpoche and the Special Guests were Speaker of Tibetan Parliament in Exile-Mr. Pema Jugney, and Kalon Yuthok Karma Gelek. The tribute event was also joined by Kasur Kriti Rinpoche, Parliamentarian Thupten Lungrig, Parliamentarian Dhondup Tashi, Alag Yongzin Rinpoche and other dignitaries. The commemoration commenced with the lightning of lamp by the Chief Guest and the Special Guest. After that the statements of His Holiness the 14th Dalai Lama, Gaden Tri Rincopche, Menri Trizin, Jhonang Gyaltsab and Tashi Lunpo Monastery were read out by their respective representatives. Special Guest Speaker Pema Jungney greeted the gathering and lauded Regional Dhomay Association, Dhondupling for organizing such an important event. He conveyed a decade proclamation of His Holiness the 14th Dalai Lama, that the 10th Panchen Lama was a champion of truth. Speaker further stated that the successive Panchen Lama have been an important religious figure in entire Tibet, but the 10th Panchen Lama was not merely a religious figure but also took utmost responsibility in politics, language, culture and environment of the entire Tibet. Above that the famous 70,000 Character Petition written by Panchen Lama denounces the China’s abusive polices and tortures on Tibetans after the occupation. Due to this petition, he was prisoned for 14 long years. Nonetheless, even after his release, he continued to advocate the protection of Tibetan language, religion and culture. The tragic death of Panchen Lama turn a great loss for the entire Tibetans. He was the binding force between the Tibetans residing in Tibet and in exile and also between Chinese and Tibetan. Therefore, we are extremely grateful for his endeavor and Tibetans, especially those living in exile, should take extra responsibility to carry forward his tireless efforts. Finally, the Speaker requested Tibetans to stay united for the greater cause of Tibet.